Rising demand for energy efficient buildings has been observed since past years. To meet demand specifications of energy efficiency, material with insulating elements are witnessing higher adoption, as they play a vital role in reducing heat loss. This has spurred the acceptance of vacuum insulation panels in the construction industry as efficient solution to reduce energy loss. Vacuum insulation panels (VIP) are considered as an effective alternative to conventional material used in building construction, as VIPs have higher thermal resistance. According to research, efforts in manufacturing vacuum insulation panels with specific characteristics suitable for old and new buildings are being undertaken. In this respect, manufacturing of vacuum insulation panels using glass fiber, perlite, foams and powder/fiber composites has been observed. According to Transparency Market Research analysis, the global market for vacuum insulation panels is expected to rise at a steady rate in the years to follow. Growth of the global vacuum insulation panels market is triggered with growing construction industry couple with increasing adoption of vacuum insulation panels in building construction. Also, their use in refrigeration applications is expected to push the sale of vacuum insulation panels across the world. The global market for vacuum insulation panels is projected to expand at a value CAGR of 5.3% during the period of assessment, 2017-2026. Players involved in manufacturing of vacuum insulation panels include Evonik Industries AG, Dow Corning, Sonoco, LG Hausys, Panasonic, Va Q Tec AG and American Aerogel Corporation. Manufacturers of vacuum insulation panels are researching on cost efficient materials for developing vacuum insulation panels. For instance, Va-Q-Tec hosted a research program in 2017 to examine thermal efficiency of nanostructured foams for VIPS (Vacuum Insulation Panels). Asia pacific excluding Japan (APEJ) region has been at the forefront with respect to use of vacuum insulation panels. Emerging countries such as China and India have shown high inclination towards use of vacuum insulation panel products across pharmaceutical industry, construction, logistics and refrigeration industry. High scope of urbanization coupled with growth of construction industry in Asia Pacific excluding Japan region is poised to influence the adoption of vacuum insulation panels, in the commercial as well as residential sectors. Demand for energy efficient material for building purposes has spurred the sale of vacuum insulation panels across major economies in APEJ, such as China, India, Australia, New Zealand, Singapore and Thailand. The sale of vacuum insulation panels in APEJ is expected to surpass US$ 3 Bn by the end of the year of assessment (2026). Manufacturers have tapped these regions owing to immense potential reflected by APEJ with respect to various end use industries. Favorable business environment of the region has attracted several players to expand their manufacturing bases. Increased manufacturing of vacuum insulation panels has been observed in the region with a view to cater to the rising demand for the product. Vacuum insulation panels are widely used in building construction owing to their nonflammable and energy efficient characteristics. As per research, silica has been widely used in developing vacuum insulation panels. Silica as core of VIPs, offers noncombustible properties and it is non-toxic. Moreover, it is also recyclable. In addition, core made of fumed silica enhances the energy efficiency of the product and also permits water vapor absorption that permeates through the insulating envelope. Silica reduces heat transfer owing to very low thermal conductivity. These factors have pushed the use of silica in vacuum insulation panels and its rate of adoption is expected to grow at a significant pace in the coming years. With increasing need of thermal insulation across various end user applications, vacuum insulation panels have been witnessing an increased adoption across the globe. The main factor influencing the growth in demand and sale of vacuum insulation panels is increasing urbanization coupled with high growth in construction industry. Moreover, application of vacuum insulation panels extends from construction to logistics industry, where they are employed in reefer containers to carry or ship food as well as non-food material. However, low shelf life owing to faster aging coupled with high pricing have posed challenges to the growth of the global vacuum insulation panels market. A new research report by Transparency Market Research gives the readers a complete market run-through describing various facets of the global market that are influencing its growth. In depth analysis on vacuum insulation panels with respect to applications of the product, the most preferred material used in construction of the panel, end users of the panel and its adoption and demand analysis scenario across various regions in the globe has been carried out with a view to gain incisive market insights. The research report includes statistics and figures on overall market size along with year on year growth rate. It also covers pricing analysis, supply chain analysis, analysis on key manufacturers and demand analysis. 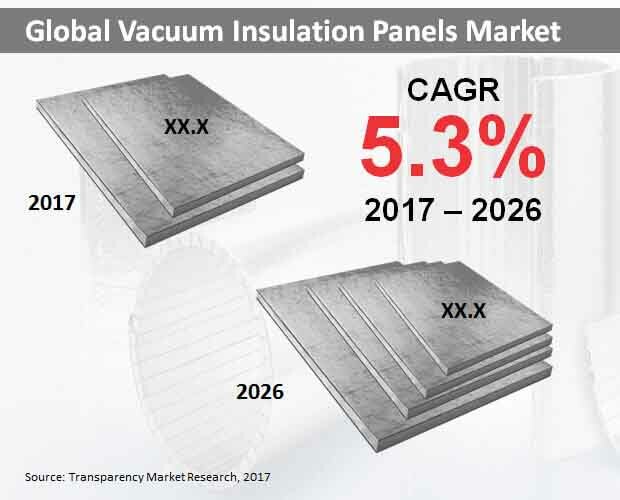 The research report on global vacuum insulation panels covers past, current as well as future market projections for a period of nine years, starting from 2017 till 2026. The research report includes various trends, developments, drivers and restraints that impact the global market’s growth. This comprehensive research report covers brief analysis on these aspects that can support businesses to plan future moves and execute key strategies in order to achieve business expansion. The research report also includes detailed market segmentation where it covers every market angle. The market segments are analyzed across regions in the globe thus portraying their changing magnitudes and dynamics. This intelligence can support the reader in analyzing key revenue pockets for his/her business operations. Analysis on various regions and sub regions gives a complete market scenario with which new product launches can be planned. Moreover, intelligence end use industries widely using vacuum insulation panels can support the manufacturers to tap the target market to gain hold in the respective region. The segmentation analysis gives a thorough understanding of potentially profitable segments in the coming years. Data collection followed by data filtering and analysis, research intelligence, actionable insights and business solution, is followed at Transparency Market Research (TMR). Research methodology used by TMR helps in gathering information and presenting in the research report in a systematic manner. Insights from various sources, secondary and primary research are triangulated to obtain data with high accuracy level. Authentic sources such as annual reports, association publications, company press releases and presentations have been referred to gain in-depth market understanding. The analytical research report on global vacuum insulation panels market includes an extensive analysis on various key players operating in the market. The chapter on competitive analysis includes profile of players involved in the manufacturing of vacuum insulation panels. Their key financials, company overview, product synopsis, and key strategies are covered in the research report.